This variation is the result of combining both the regular padded strap and the wrap strap. 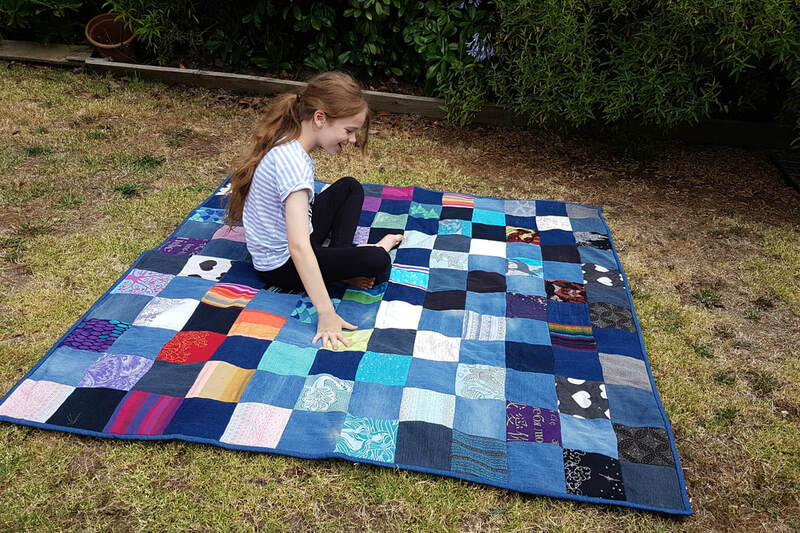 These start with a padded section at the top of the strap and then transition to a flat wrap strap half the width of the wrap (or to about 33cm if the strap is made from fabric other than a wrap). The wrap part of the strap can be worn bunched or spread out. This strap style is my most popular style. Pro: You don't have to worry about pressure points if you don't get them spread just right. Straps don't spread over your shoulders as far compared to wrap straps in a back carry which some people prefer. You can spread the straps up over the body of the carrier for more support but just tying them unspread like regular meh dai straps works great too. You can use the spread out strap to widen the base of the carrier. 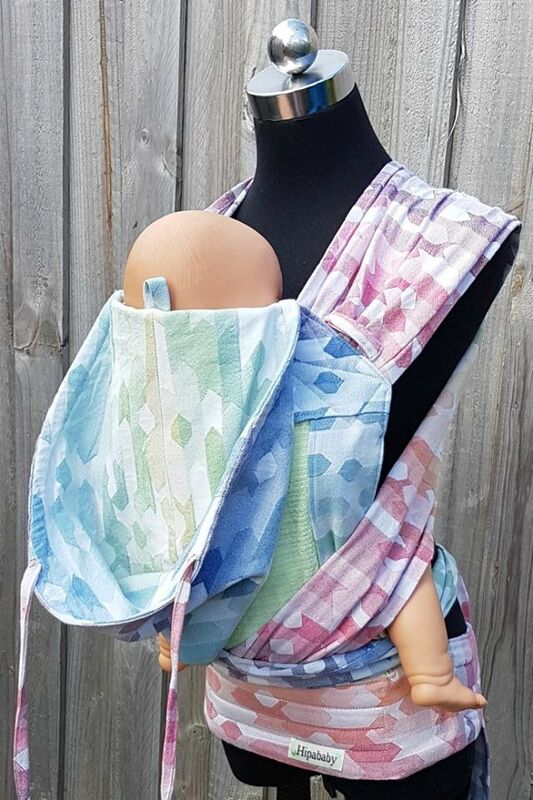 ​Con: Petite wearers (under size 10 (Australian sizing) may need petite padding especially if you like to wear your baby in a high back carry as this will give more space for the wrap part of the strap to spread out. Two styles of wrap strap are available - pleated and gathered. The gathered style spreads a little more widely but they feel similar to wear. Pro: Some people love the wrap like feel of unpadded wrap straps. 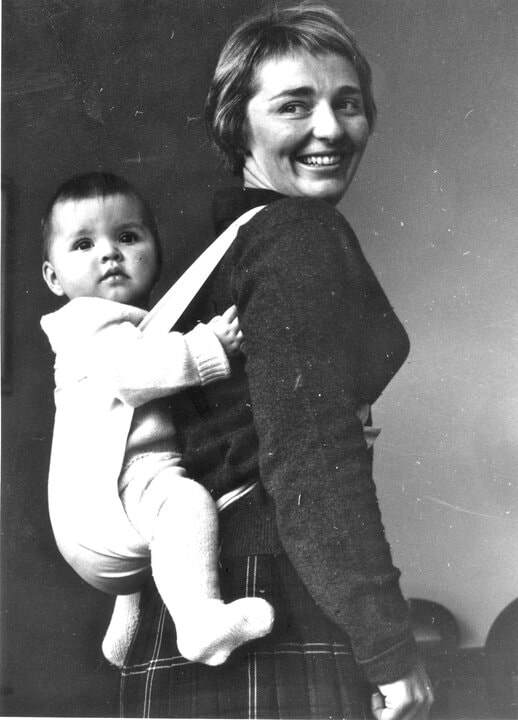 The straps distribute the weight of baby well and you can spread the shoulder straps as much or as little as you like. You can tailor the perfect fit by tightening the straps in just the right places so it feels comfortable for you. Works wonderfully for front carries. Con: May not be as comfortable as padded straps for back carriers (although this is personal preference). as these straps work best by cupping the shoulder. Wrap straps sometimes need careful spreading so the strap is spread out comfortably over your shoulder so may take longer a little longer to put on. May sometimes feel restrictive if you need a lot of arm movement. Unpadded wrap straps sewn in with gathering. ​These straps are IIcm wide the entire width and lenght of the strap with padding over your shoulder. Easy to use, nothing to spread so quick to put on and less bulky so easy to carry around in your bag. 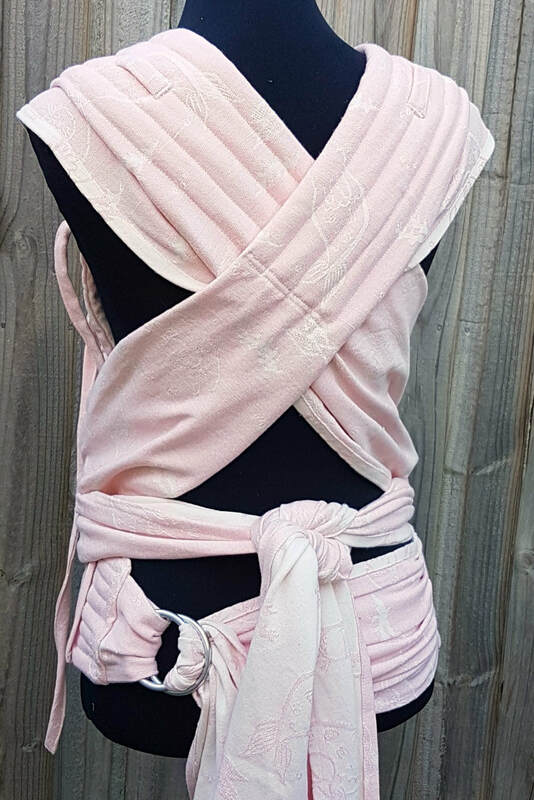 Padded straps are slightly less versatile as there is no wrap part of the strap to spread out for extra support if you need it but you can tie a lexie twist over baby's bum or a tie chestbelt (i.e tibetan style) for some extra support if you need it and that works well. 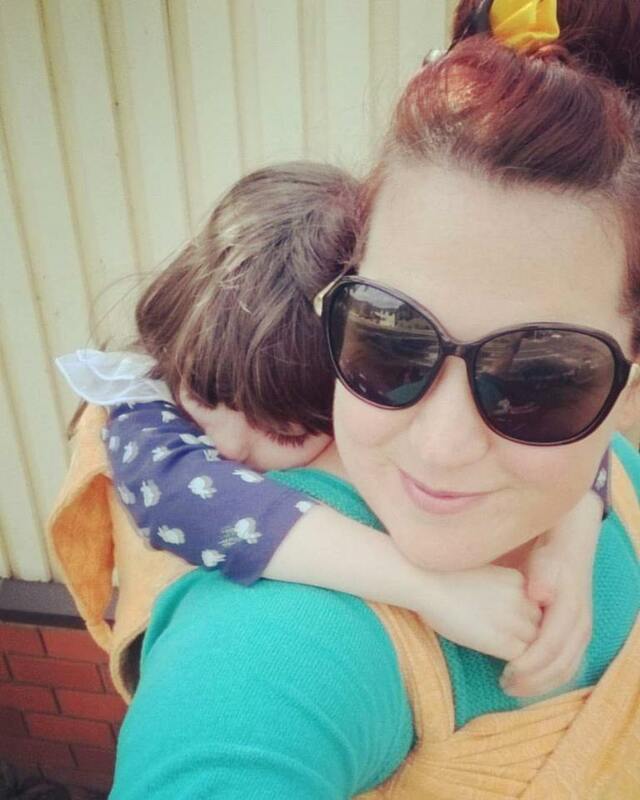 Without wrap straps you can't widen the base once the width has started to be outgrown (but you can still use the straps to pull your toddler knees up to a more ergonomic position). If you don't often spread your straps this a comfortable and compact option. A combination strap is a hybrid between a wrap strap and a padded strap at your shoulder (best of both worlds!) It gives extra width to spread over your shoulder but you can leave it unspread (useful for back carries). ​The flap which pulls out over your shoulder can be over or underneath the straps. 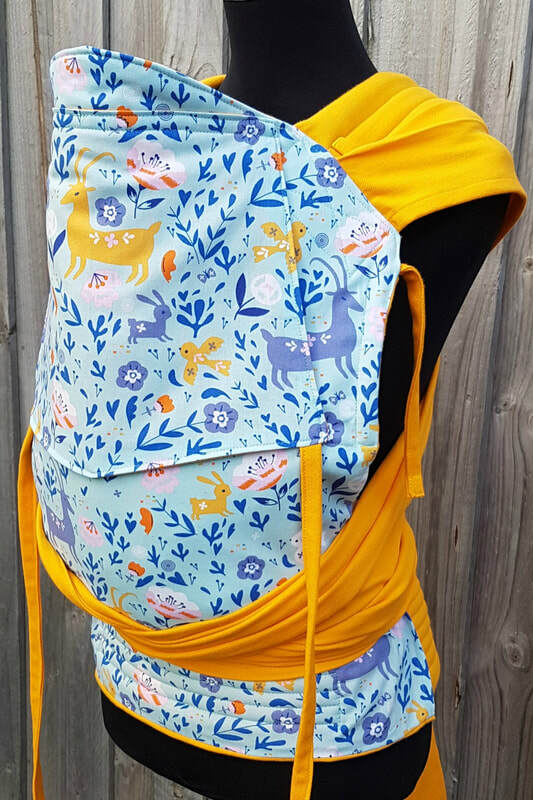 The fold over is the default but but it can be useful to have the strap sewn the opposite way (to pull out from underneath the strap) for a reversible carrier as you will see more of the reverse colour on the reverse side of the strap. (If you would like the straps to be sewn the opposite way to usual please let me know). Strap flap folds over the strap (default). Flap folding out from underneath the strap. Strap Lengths: Standard strap length is 2m which is long enough to lexi twist and tibetan tie for most people but may be too long for a petite wearer who may prefer the shorter length(187cm). Plus-sized wearers may need up to 230-250cm of strap to have the most tying options. ​I am limited to information I can find in books/online which is in English and tends to cover mostly the US, and to a lesser extent Australia, Great Britain, New Zealand, and Canada so if there is any information I am missing (especially from non English speaking countries) please let me know! 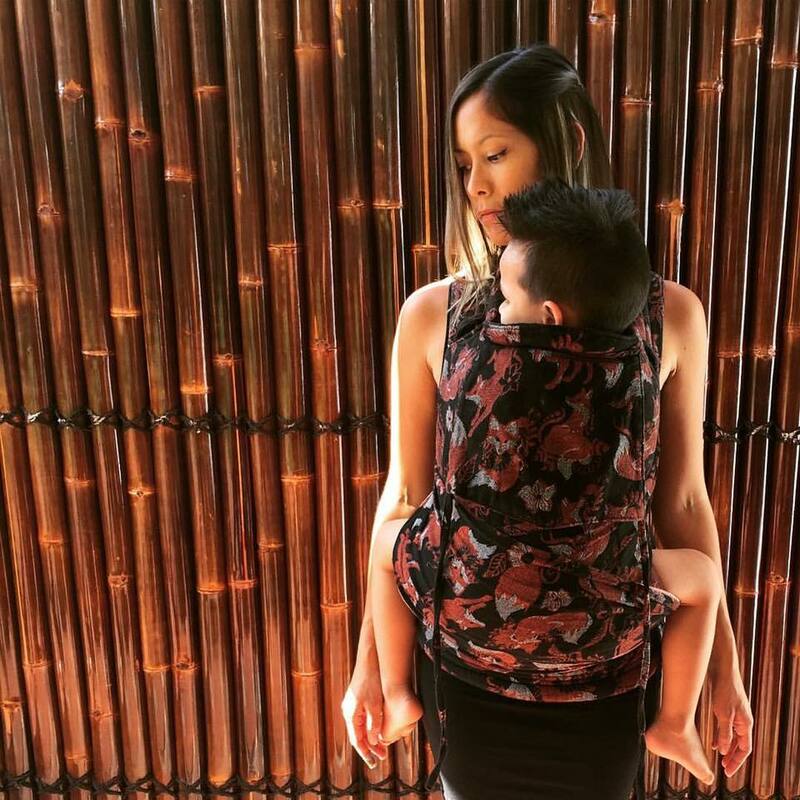 When this style of carrier and similar ones from asian countries like podaegis/ hmong/nyia, and onbuminos became popular in the US in the early 2000’s they were lumped into the umbrella term Asian style Baby Carrier (ABC for short) . 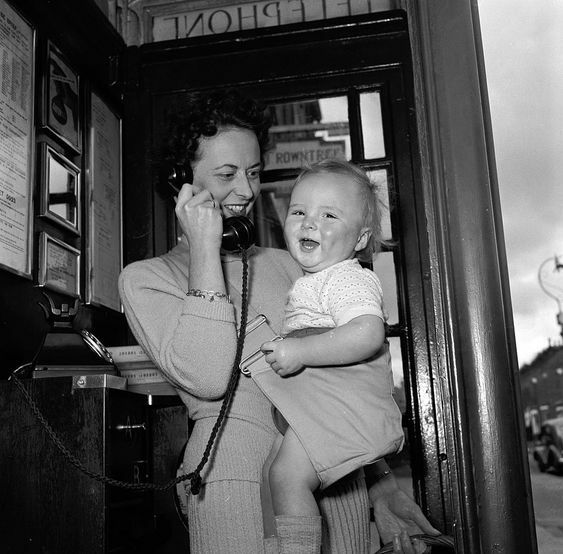 When reviews were fist set up at The Babywearer (the most popular online babywearing forum at the time) there were only categories for "traditional carriers" and for "soft pack carriers" and no separate category for 'mei tai'. However it was soon suggested that as these carriers were inspired by traditional Chinese carriers the term mei tai should be used to better reflect the carriers origins. More recently the spelling meh dai or bei dai has become popular as it more accurately reflects the pronunciation in the Cantonese and Mandarin dialects of Chinese respectively. There was certainly variety in Chinese meh dais. There was variety of body shapes, hoods made of lattice work fabric strips, shoulder straps padded with plant material, headrests and even pockets! 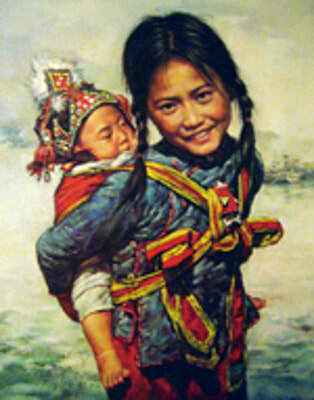 Carrier covers for cooler weather are found too Many traditional carriers are beautiful works of art, embellished with intricate embroidery with symbolic and cultural meaning (I highly recommend the book 'Bonding via Baby Carriers' – there are many wonderful Chinese baby carriers pictured). Traditional Chinese meh dai’s were usually tied with the straps twisted at the chest and any excess tucked. 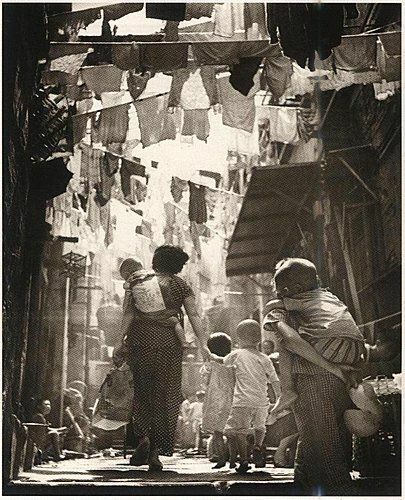 ​The traditional carriers used in Hong Kong had four Straps around 110cm each, tied at a knot at the chest. At the end of one or both shoulder straps the corners were folded over to the centre to form a pocket in which to carry a few coins. In the 19th and early 20th century The panel was quite large measuring up to 60cm. Gradually the overall size of the carrier became smaller during the 20th century. The carriers worn by the Cantonese and Hakka were about 25cm square. The shoulder and waist straps were a continuation of the top and bottom edges. The Hoklo and Tanka fishing people used carriers which were slightly smaller overall, longer straps were fixed diagonally to the four corners. Head supports were often attached. These were made of folded strips of cotton about Icm wide stitched at intervals to form a lattice square and attached to the top edge of the carrier to support the baby’s head. 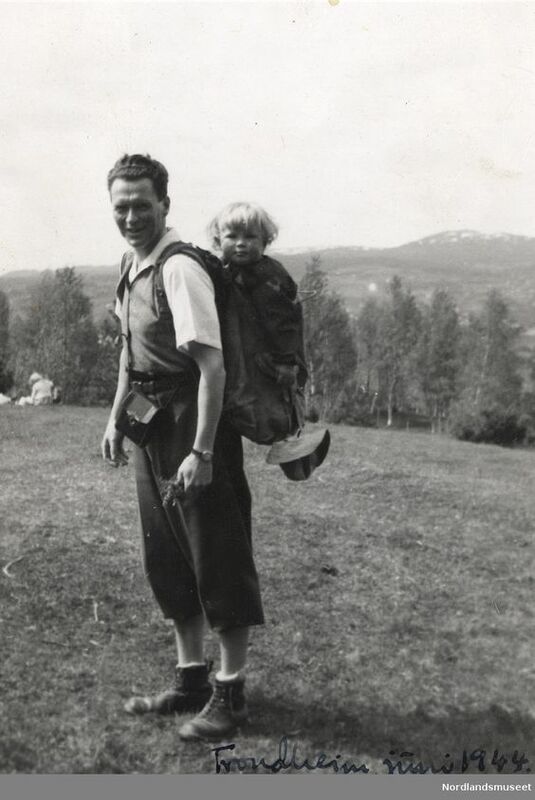 In the 1970’s it was usual to see most young children carried in these cloth carriers. Sadly By the early 2000’s the use of these traditional carriers has almost completely disappeared. 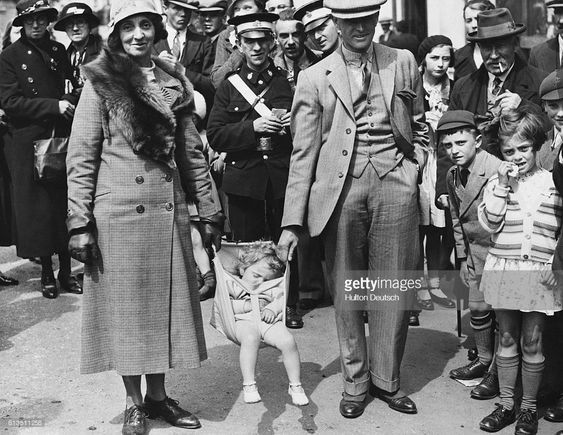 Imported mass produced had mostly replaced them and most mothers tended to carry their children in front following Western fashion. 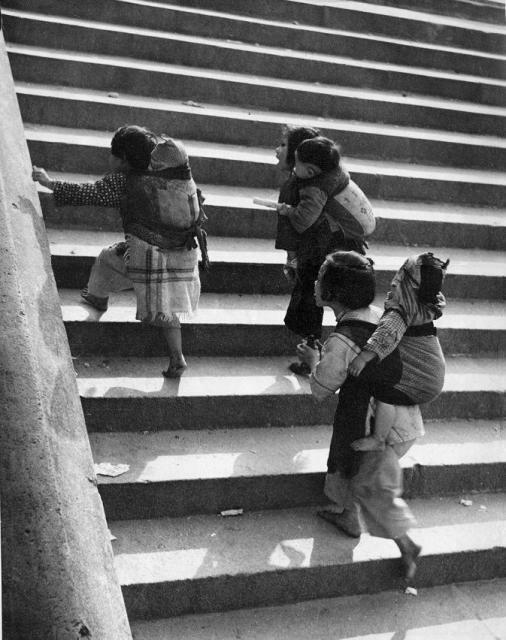 Western children in Hong Kong were usually carted around in prams. 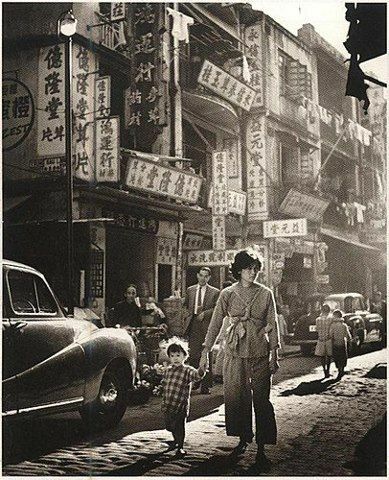 The exception to this was in the early's 1940's when Hong Kong was occupied by the Japanese and many western families were interned in Stanley Camp. 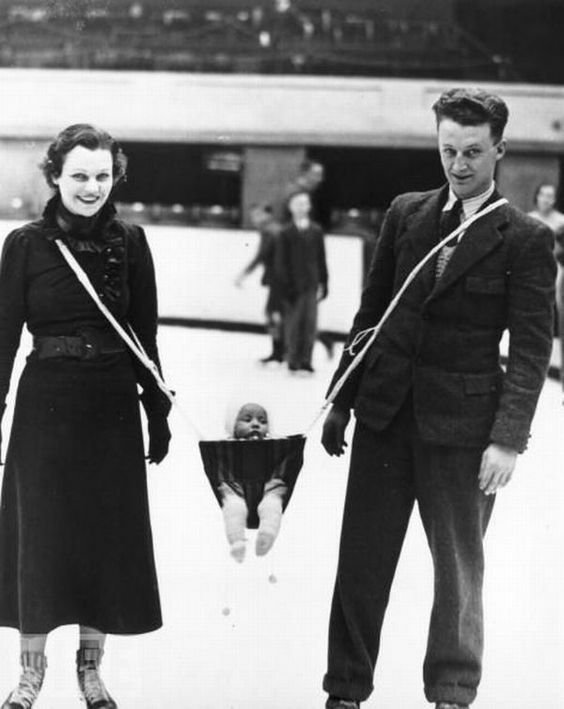 Traditional baby carriers were used by mothers and babies there. 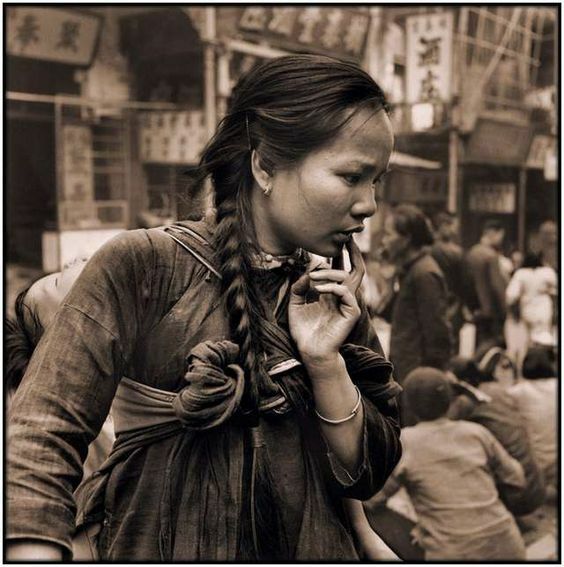 Early western versions were quite close to the traditional Chinese ones. While there was quite a bit of variety in the traditional ones they generally they had thinner, unpadded, and shorter straps than the meh dai’s seen in western countries today. The meh dai seems to have first appeared in the west in Australia first in the 1960’s. Variations may have been around before this in other western countries but I haven’t found any other earlier commercially made examples so far. There were very few commercially produced meh dai's or similar carriers with tied straps before the early 2000’s. 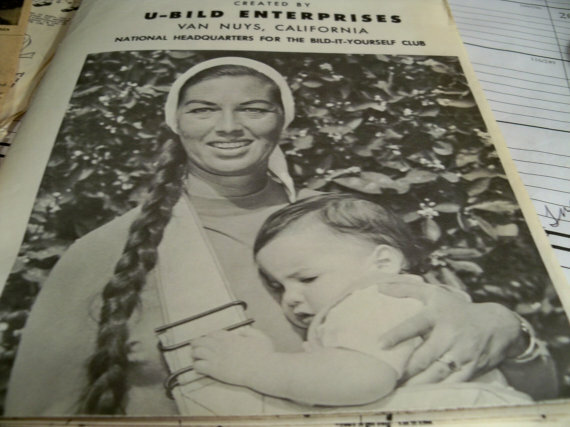 The meh dai (Meh tai) sold be the nursing mothers association is the earliest example I have found. It was quite close to this traditional design with four relatively short straps designed to be tied at the chest by twisting all four straps together. 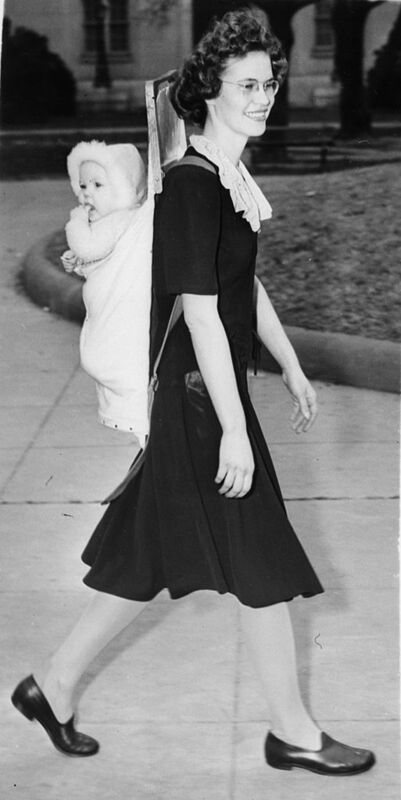 The carrier was also fairly lightweight with thin straps (but the shoulder straps were padded unlike in a traditional carrier). 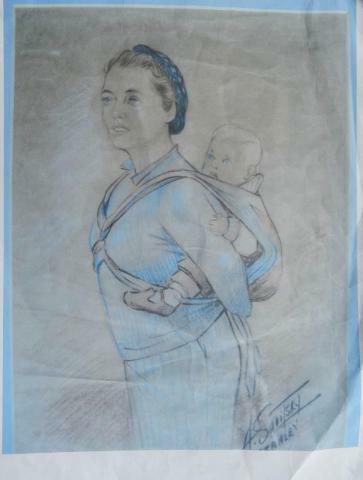 This early version of the mei tai was designed and sold be the Australian Breastfeeding Association (then called the Nursing Monthers Association). It was sold as the Meh Tai and later a version with clip version which did up with buckles was designed. The ABA meh tai had short straps and could be worn in the traditional way or in this variation. The lower straps were tied around the waist like an apron. 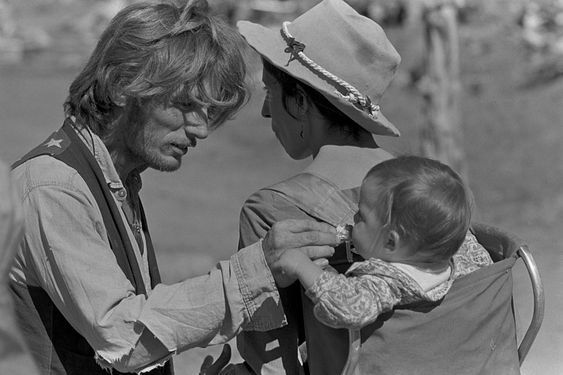 Then the baby was held against your chest and the body of the sling pulled up over baby's back. The top straps went up over your shoulders, then crossed behind your back, then each should strap was tied onto the waist straps. "In 1966, NMAA Founder Mary Paton and her family were featured in a Herald newspaper series about Melbourne families. This busy mum literally flew home from another engagement to meet with the reporter and photographer at her home. 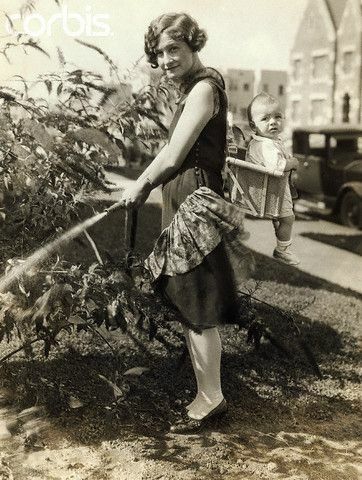 Whether by good luck or intention, Mary had her youngest child on her back in a Meh Tai and the photographer suggested she "do something" he could photograph her doing in this strange thing. Mary grabbed the vacuum cleaner and was thus captured for eternity cleaning the house wearing a smart dress and high heels - donned for her earlier engagement! The response from readers was amazing, contacting the newspaper asking where they could buy such a thing - and Mary quickly announced that NMAA made and sold them"
This photo was published by the Herald in 1967 to help publicise the Meh Tai and was used on the Meh Tai packaging and instruction sheet. Another newspaper photo that appeared on the front of the Wagga Daily Advertiser February 1976. Below in the Meh Tai instruction booklet from 1984. Some more examples - produced later but still the same design. There was also a similar style being sold by at least one US LaLeche Leaque group in the 1970’s. 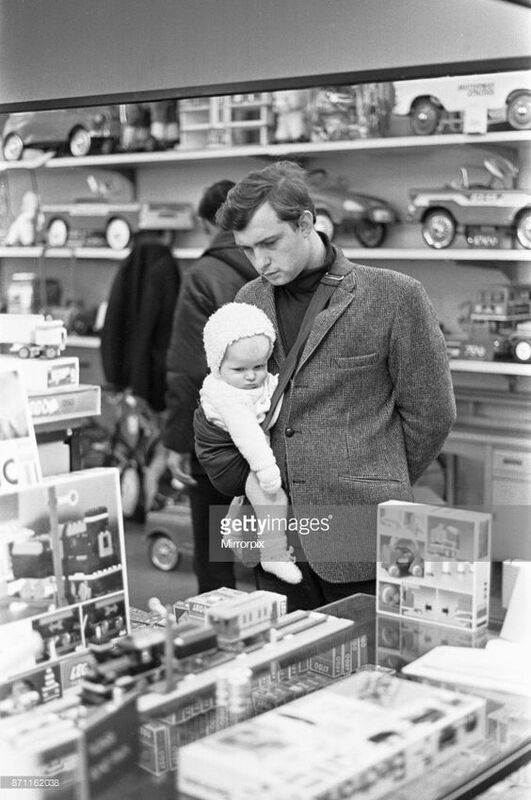 'Later on, in 1975, my second child was born. By that time I was a member of LaLeche League and our little group was making a mai tai-type carrier out of soft denim with a Raggedy Ann or Raggedy Andy appliqued on the seat and selling them for $7. each to support our group! I so wish I had a photo or had kept it. It was so cute! And handy! 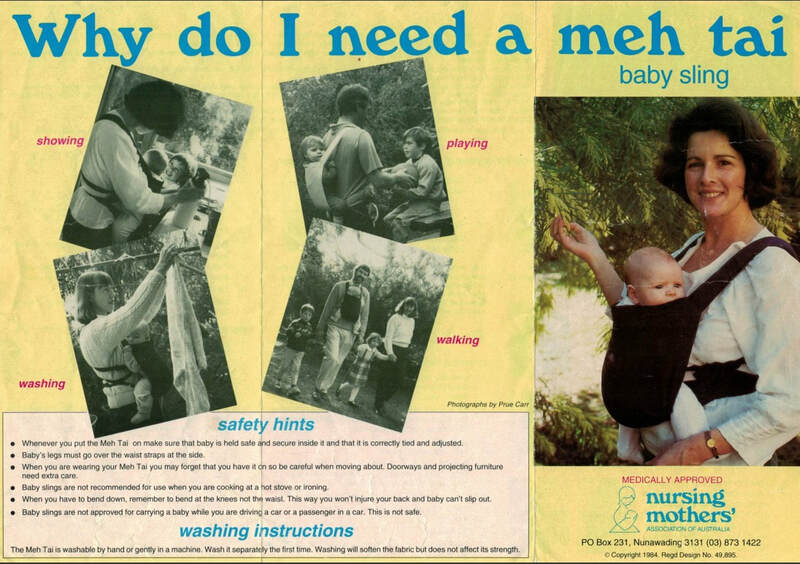 Instructions to DIY mei tai like carriers could be found in Family/ DIY/ Mother's magazines in the 60's,70's,80's, but overall information access to traditional baby carriers before the internet allowed an explosion of sharing is fairly rare. ​I have a separate blog post about this pattern if you would like to learn more here. "It's deceptively simple. It's made of washable cotton stretch velour, no buckles or anything to adjust. 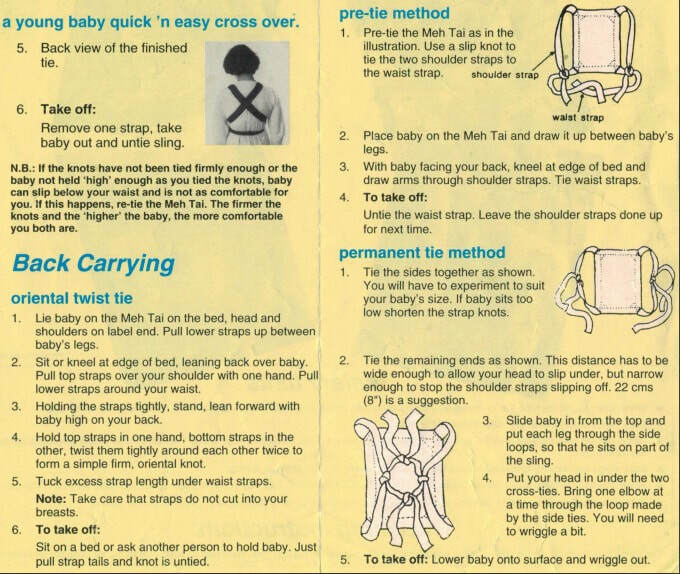 You just place the baby on it, bring part of the carrier up through her legs, tie it around her waist, then bring two long straps up over your shoulders, cross them in back or front depending on where the baby is and tie around your waist on the other side. Baby can be face in or out, front or back (4-ways) and (this is the best part) is so secure you can bend down to pick up something off the floor and s/he won't fall out. It's incredible comfortable to wear. 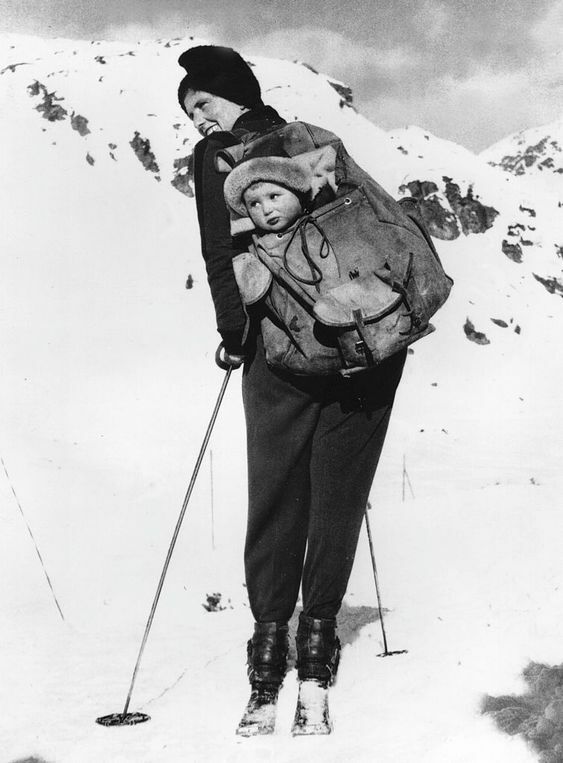 I have a bad back and I could hike for hours with a 4-month old in this carrier. 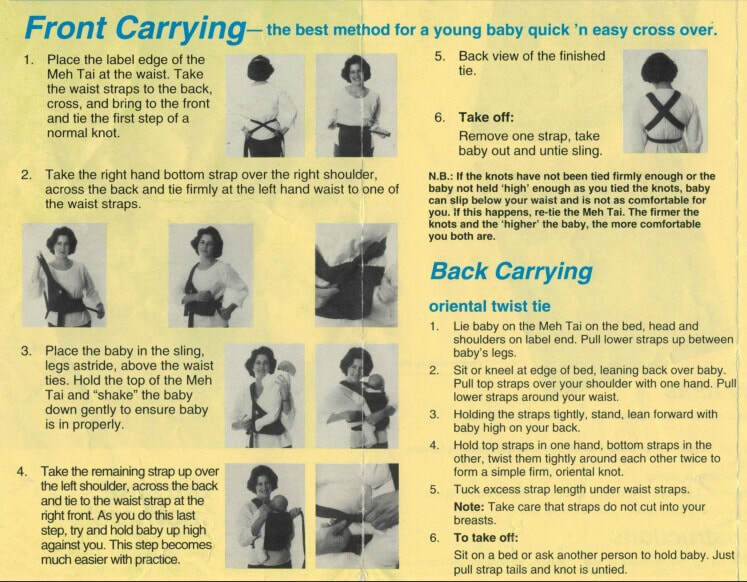 Mei tai’s really took off around the early 2000’s probably at least partly due to the fact that the internet had made the sharing of information about different baby carrier options much easier. A cottage industry was soon born - many online shops were opened with each small company or hobbyist adding on their own distinct twist to the meh dai. These makers developed many of the features and fabrics we see on meh dai's today. 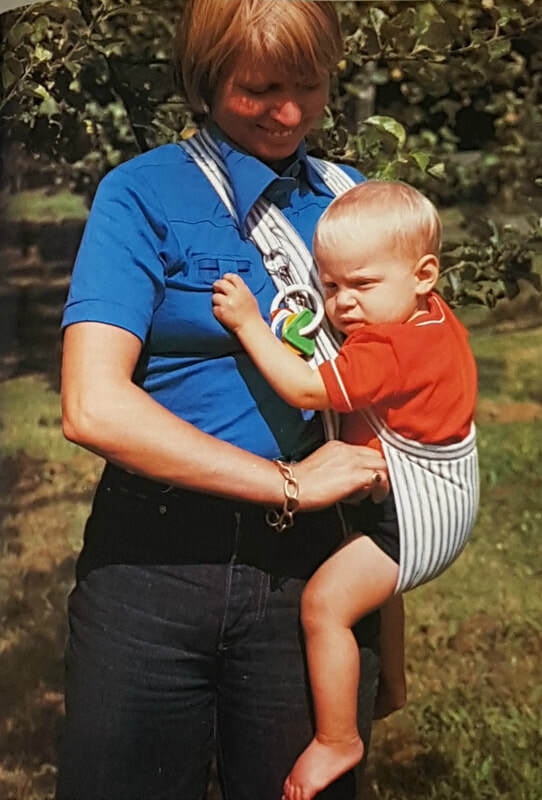 There are now dozens of different brands of mei tai’s (some still available new and some no longer in production) with a wide variety of features such as head supports, sleeping hoods, pockets, long padded or wrap style straps, mesh panels for hot weather, and cinchable bodies for easier use with different aged babies. More about this in part 2! Another wrap scrap skirt! This is made from the same pattern as the Vatanai skirt I made. The pattern I used was the Lovejill reversible wrap skirt (bought from Etsy). I really like this pattern although I think it is best made in a drapey non wrap fabric, like a lightweight cotton. It was a hassle to get the hem sitting nicely as one side or the other (mainly the lining) seemed to settle unevenly probably because cut on the bias the wrap is stretchy (had the same problem with the Vatanai version). I fixed it in the end but it was rather time consuming to get right. The skirt is made from an Ellevill Paisley Tango - bamboo/cotton blend. These same colours are used in the Jade Chilli ring sling (available in my shop here). 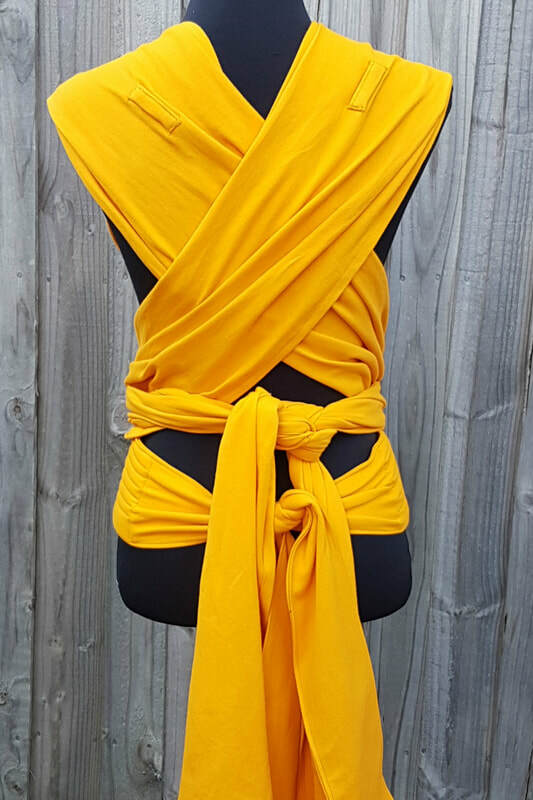 This wrap is lightweight and has a lovely drape so perfect for a wrap skirt. 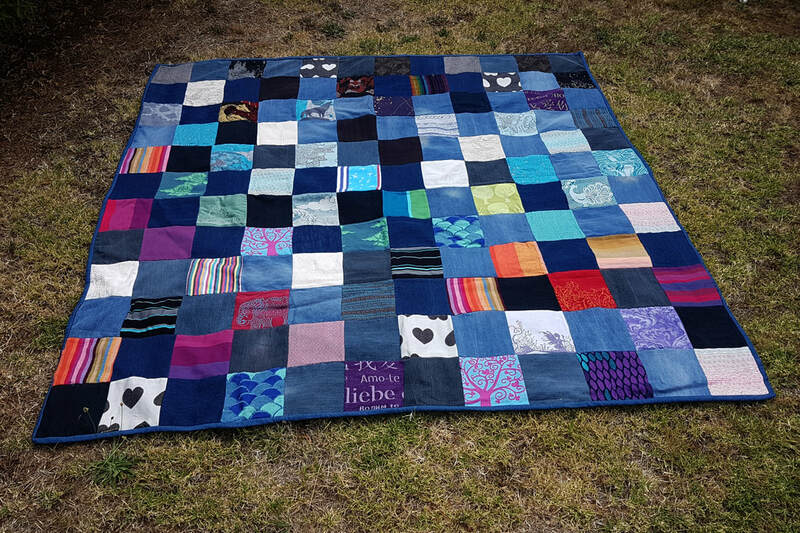 The lining was upcycled from an op shop find (it was probably a small tablecloth originally). I loved the vintage vibe (and I love strawberries too). How do you modify a Hipababy full buckle to make it a better fit for a small baby? With a custom made carrier you the option is available to add a built in cinching system and some in stock carriers will have this available too. If your carrier doesn't have the built in adjustments you can modify your carrier by cinching the base with a ribbon and/or wearing the waist apron style. Wearing the carrier with the carrier a little higher on your body than shown below will also shorten the body panel further. 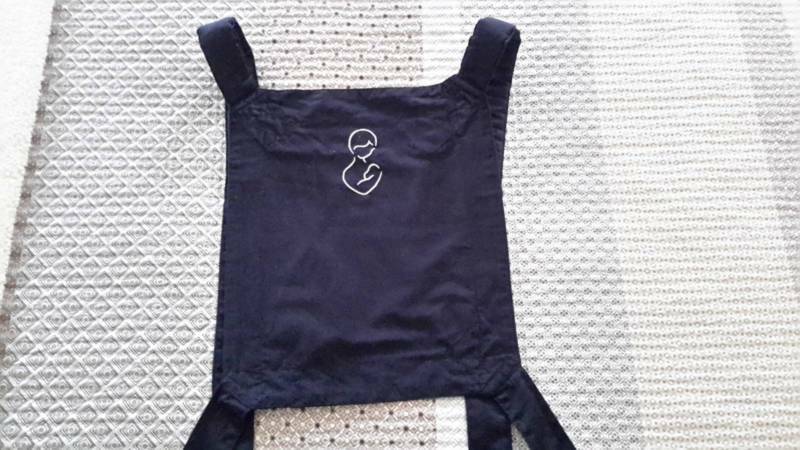 ​A baby size carrier (38cm x 38cm/ 15"x 15") is suitable from around 6 months or so but when cinched will work from around 6kg/00 clothes (or around 2-3 months). Infant size (35.5cm x 37cm/14" x 14.5") works from around 4 months uncinched or from newborn (4kg cinched). Don't use a larger sized soft structured carrier with a small baby as you will not have enough back support increasing the risk of slumping. ​When using a full buckle with a baby under 4 months baby's back must be well supported and baby's chin must not fall onto their chest (which can obstruct breathing). Baby also must not be buried right down into the carrier. Ideally you would want the top of the carrier (where the straps are attached) no higher than earlobe level. Below are some tips and tricks on how to use the built in adjustments, or if you have basic carrier without built in cinching some tips to help to get a better fit. 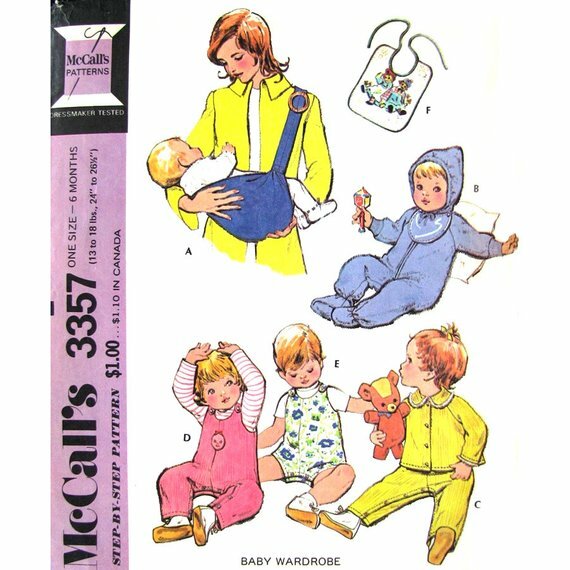 The carrier in these instructions is a baby sized carrier with adjustable base and sides. The demo doll is wearing 00 clothes so is around the size of a 3 month old. If you have a standard carrier with no built in adjustments you can use a ribbon or accessory strap to cinch the base of the carrier to a narrower setting. It is easier to tie the ribbon on with the waistband already clipped around you as the waistband will lay flatter that way. Tying with a ribbon will also shorten your carrier a little. If you need to shorten the height even further you can wear the waist apron style (more on that later). Waist worn non apron style cinched with a ribbon. If your carrier has built in adjustments cinch the carrier as shown in the photos and then put your carrier on as normal. Pull the height adjustment ties and tie in a loose knot. Fold the edges of the waist back on itself like an accordian. This will keep the fabric from slipping back and will cover the velcro strip. For an in between width, fold more loosely or just scrunch the waist instead. Remember make sure your baby is close enough to kiss! This will ensure you can moniter baby's airway and the higher you wear the waistband the shorter the panel will be be which also helps to get a good fit. Wearing apron style will shorten your carrier even further. You will need to remove the buckles and re-thread them the opposite way for this method so your buckles don't end up upside down. Flip the waistband so the reverse side facing out and the panel is hanging down like an apron. You may also need a ribbon for this as the folds on the adjustable waist tend to spread a bit wider when worn apron style. Put the panel on as you normally would. When you are finished you will not see the waistband under baby's bum as you would when wearing in the regular way. If your carrier has a built in height adjustment you can cinch the panel before putting the carrier on and that will shorten the carrier the maximum amount. Height of the panel uncinched. Height of the panel cinched with the built in drawstring and headrest folded down. Summer is here! Your baby still wants to be carried but how can you be more comfortable when the weather is hot? Here are some tips. Do I need a summer carrier? Not necessarily. If you have a carrier on the warmer side and are going to be spending a lot of time in air conditioning and/or don't often need to go out in the hottest part of the day you may find your current carrier just fine. When you do venture out you can make sure you and your baby are well hydrated and dressed lightly, and you can use accessories like cooling towels to make summer wearing more comfortable. 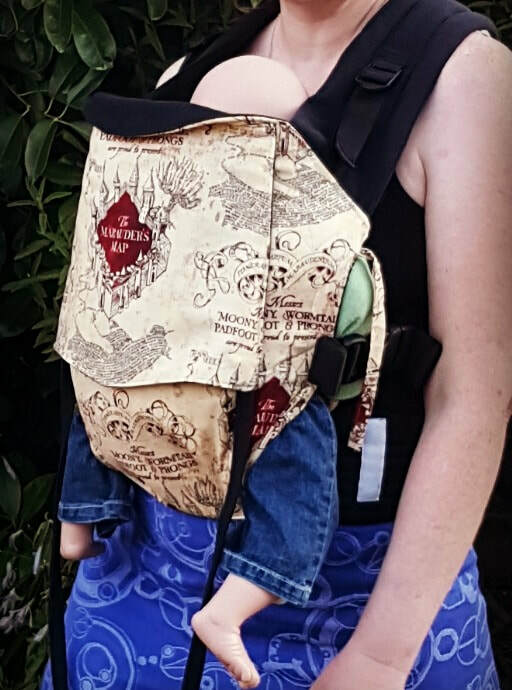 If you are looking for a summer carrier though there are lots of options! 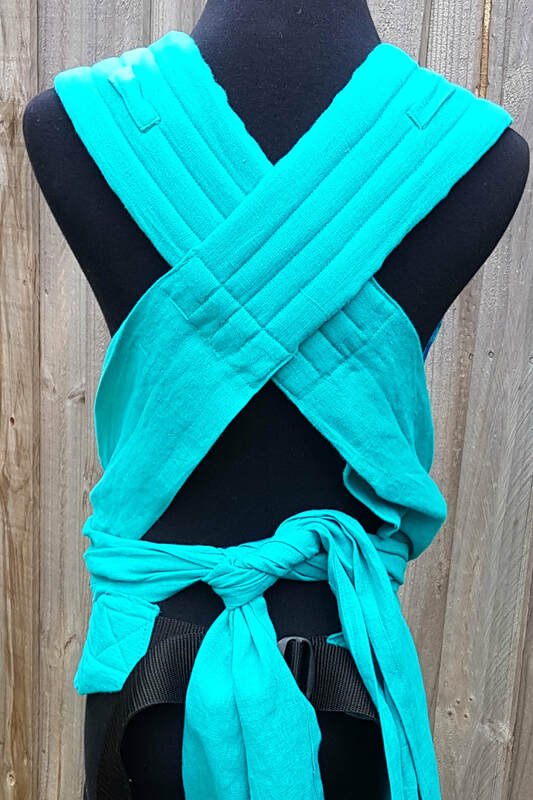 Ring slings are a great option for summer since there is only a single layer of fabric over you and your baby. Choose a summer friendly fabric like linen or silk. Cotton jaquard or wrap conversion ring slings often also work well, especially if you choose lighter, airier options or linen blends - just avoid very dense and heavy wraps. The tail of your ring sling can also be used as a sun shade! For a two shoulder (or no shoulder!) option, try a narrow blanket podaegi (also know as a Nyia) as the weight bearing portion of that carrier is the straps so the body of the carrier (blanket) can be a single light layer of fabric. Meh dai's (mei tai's) can also be fine for summer since they are generally lighter than a lot of buckle carriers and less bulky (although my buckle carriers are non bulky so a nice summer option too!) Meh Dai's and SSC will usually give good aiflow due to the open sides (if you have wrap straps just bunch rather than spread them). 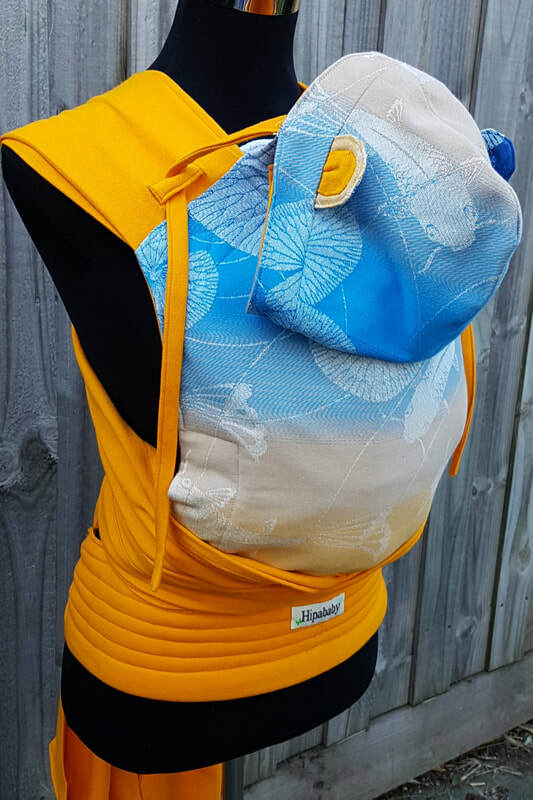 When choosing a meh dai or buckle carrier for summer look for lighter breathable fabrics like linen, a medium weight canvas or a lighter weight wrap conversion (linen blends are nice). Some mei tai's and buckle carriers also feature mesh panels. Flat hoods tend to be cooler than hoodie hoods as they allow more airflow along the sides. Linen is a great fabric for summer. It is a natural fibre so is breathable as well as airy, and has great moisture wicking properties which help to keep you cooler on hot days. Linen is great for ring slings and feels very supportive despite it's lighter weight (linen fibres are very strong). Linen also works well for meh dai's and buckle carriers. ​Cotton can work well for hot weather, depending of the weight of the fabric. Medium weight cotton duck is a great summer weight for meh dai's/ mei tai's and half buckles. Bamboo can also work well for summer. Bamboo can often be found in exercise and summer clothing as like linen it wicks moisture and is very breathable. It offers some protection against UV rays and is antibacterial. Mesh panels help to keep your child's back cooler (they don't benefit the parent so it's still a good idea to look if the carrier is non bulky and breathable overall). Solarveil is my favourite mesh. It's very airy and open and is the coolest mesh I have ever tried. It is unfortunately no longer being manufactured so once my stock of it is gone that's it! Heavier mesh like kooknit and spacer mesh are still helpful though in maintaining airflow and are available in a wide range or colours. Consider the weight of the fabric too. A thinner cotton or linen will be cooler than a heavy linen blend. However thinner fabrics can sometimes be less supportive so it is important to consider the age and weight of your baby. 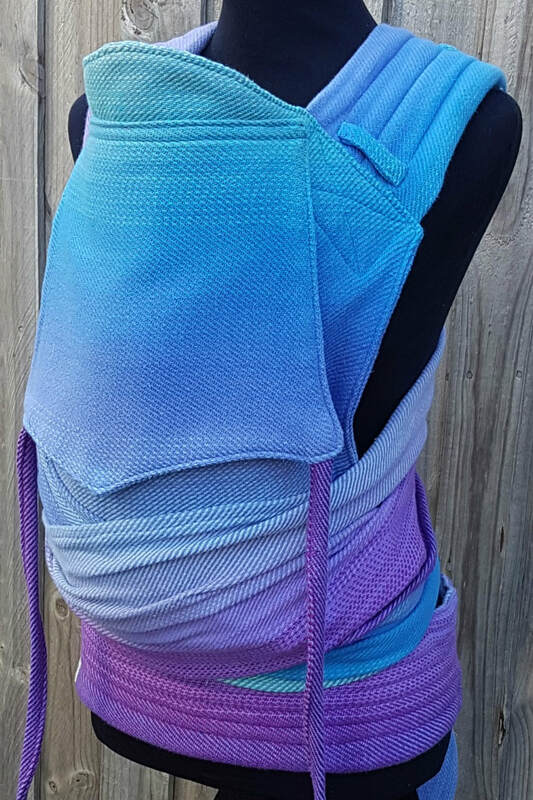 A lighter weight baby carrier will allow some cooling through the fabric itself, so choose the lightest weight carrier that gives you the support that you need. Babies have delicate skin so it's important to protect them from the sun. For the best protection against UV rays remember that any fabric convering skin is a good start, but fabric alone in not necessarily going to have a high SPF (with the exception of purpose made UV resist clothing) so choose a baby safe sunscreen and a hat. Avoid being in direct sun for extended periods of time, especially between 10am and 4pm when the UVB rays are at their strongest. 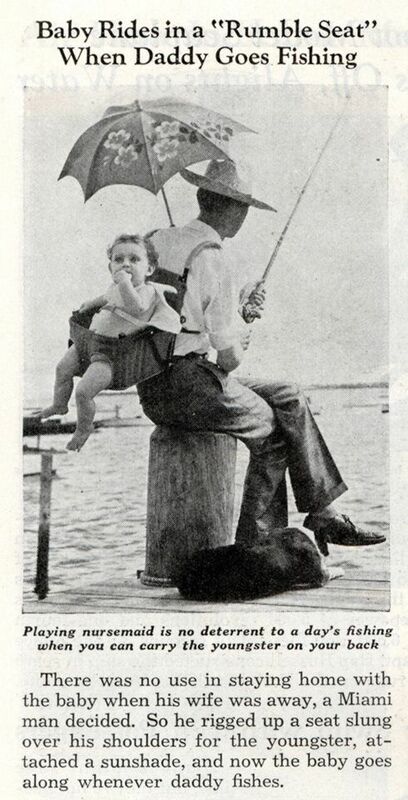 If it isn't possible to avoid the hottest part of the day you can try using an umbrella, a light cotton blanket/fabric, or the tail of your ring ring sling to provide some extra shade. Use water! Bring a spray bottle or portable mister to cool yourself and baby down or drape a cloth dipped in water around your neck (or use a cooling towel). Cooling towels absorb and hold water. You can then wrap the towel around your neck or head for a cooling sensation. Any towel soaked in cold water will help to cool you down but the difference with cooling towels is that they are supposed to hold the coldness in longer which in turn gives longer relief from the heat. Rinse your shirt in cold water to provide some temporarily relief. Keep yourself and baby well hydrated. Breastfed babies under 6 months don't need extra water but may need to feed more often. Clip on Cooling Fans - these can provide temporary relief and be clipped to the shoulder strap of your carrier. Look for the version with foam blades for added safely. 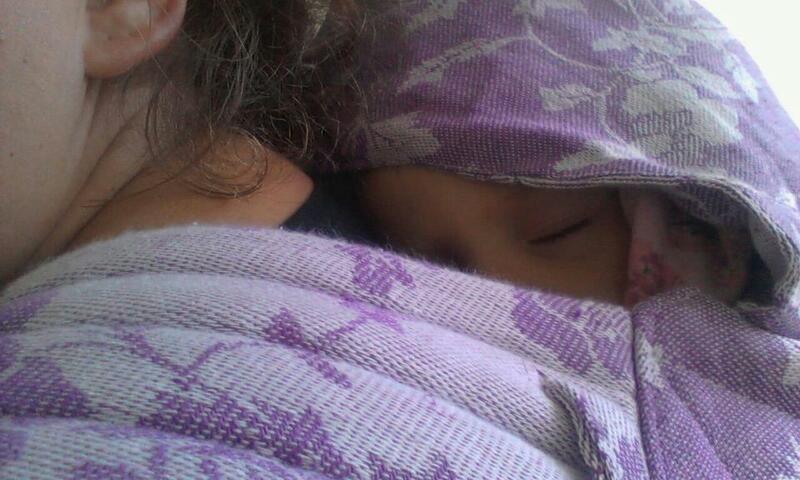 Consider keeping a layer of fabric between you and baby so you both feel less sweaty. Wear a top with a higher neckline or place a thin piece of material between you. Remember that whatever carrier you are using acts as a layer, too so dress baby lightly. Stay in the shade whenever possible and schedule activities for the cooler parts of the day. 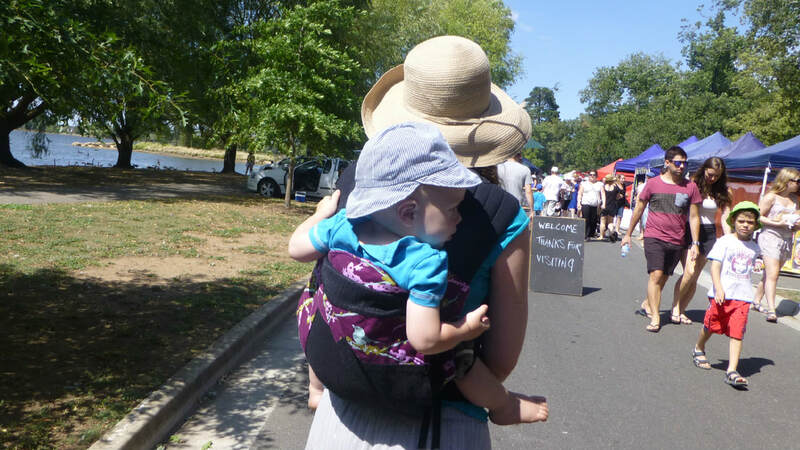 Wear a wide brimmed hat and choose a hat for baby with a velcro strap so baby won't pull it off (handy for back carries!) Try an umbrella to make your own shade. 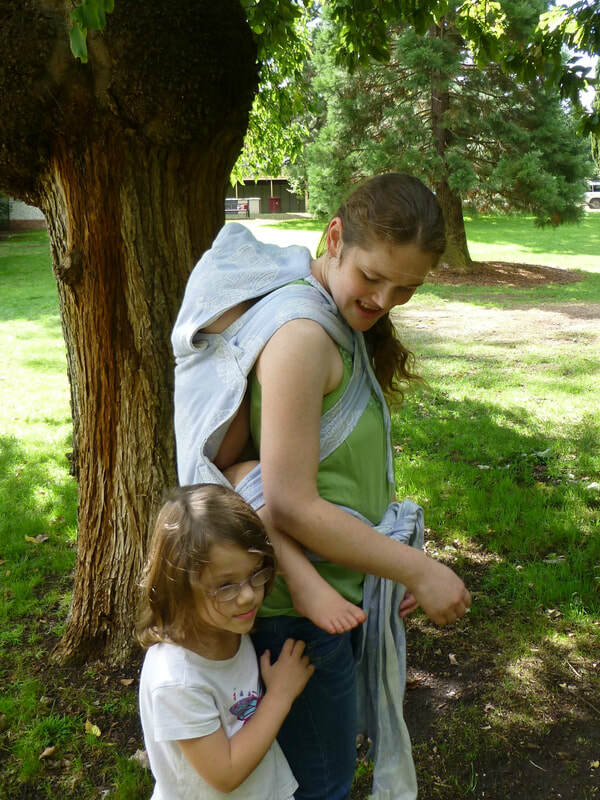 You can also use the hood of your carrier or the tail of your ring sling for some extra shade. 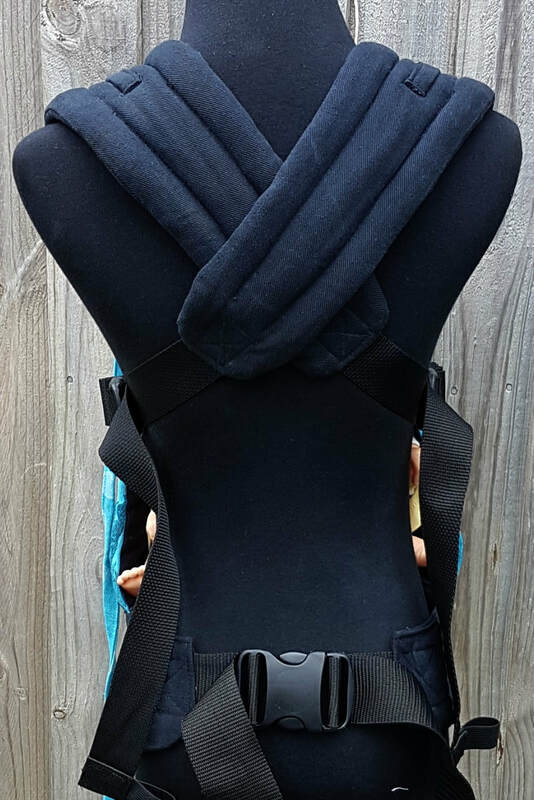 If you are wearing a buckle carrier occasionally loosen the shoulder straps a little and move your baby away from your body slightly to let some air flow between you. After you have cooled off tighten the straps up again. 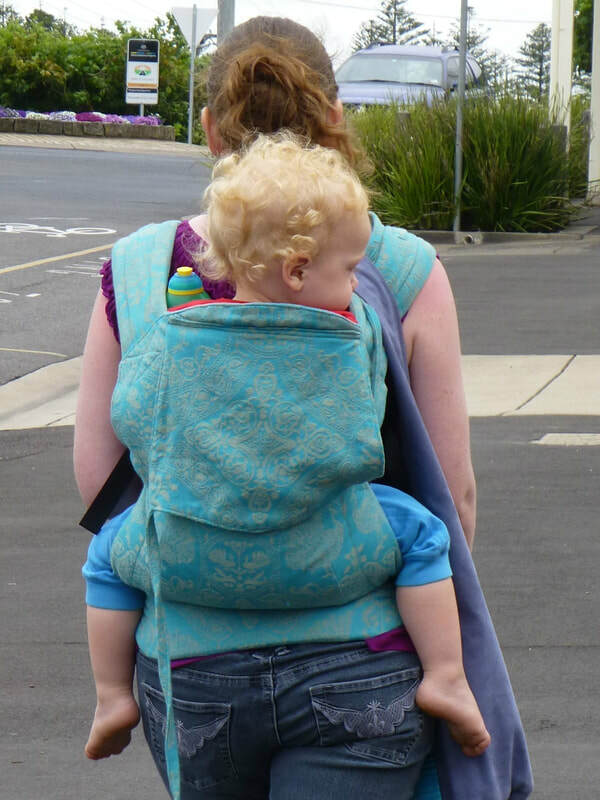 If you have an older baby or toddler try a hip or back carry to allow for more air flow. ​Create your own breeze. 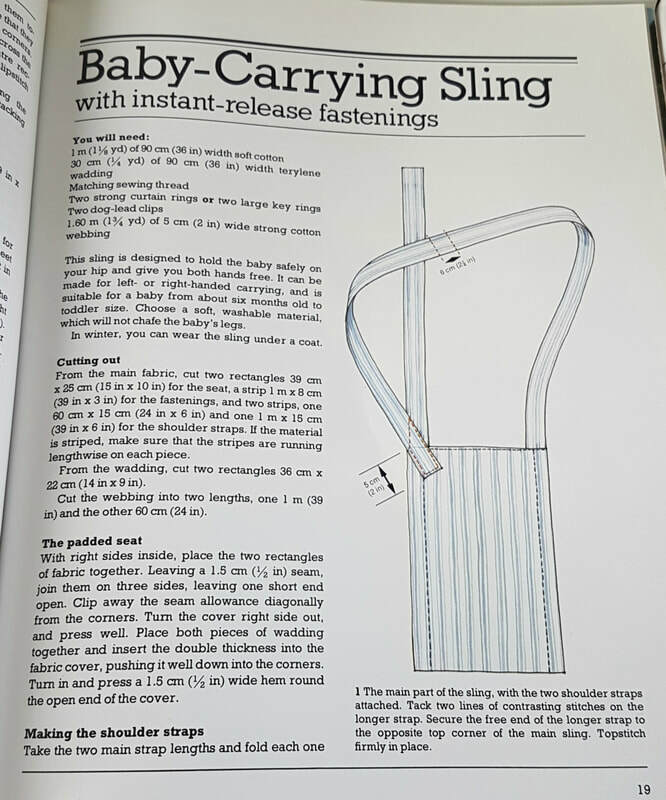 Fan yourself with your ring sling tail! 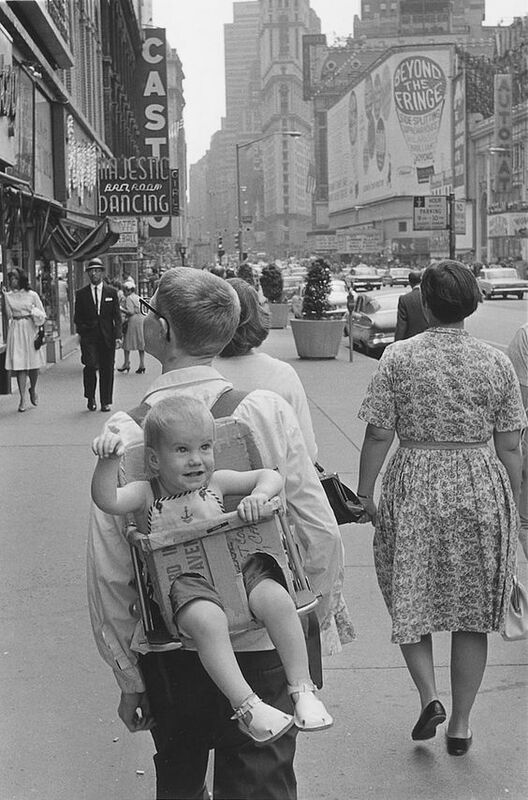 Walking can provide some airflow but if you are sitting still for a while (and it's convenient) take baby out of the carrier for a break to cool off. What's so great about a narrow blanket podaegi or nyia? Fits your child until they no longer want to be worn. 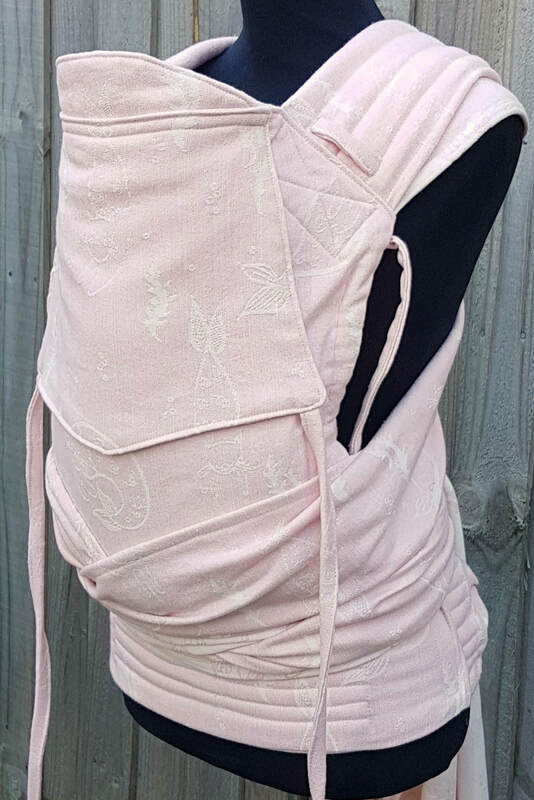 A newborn can be worn on the front in a wrap cross carry or kangaroo carry and a 5 year old on your back. 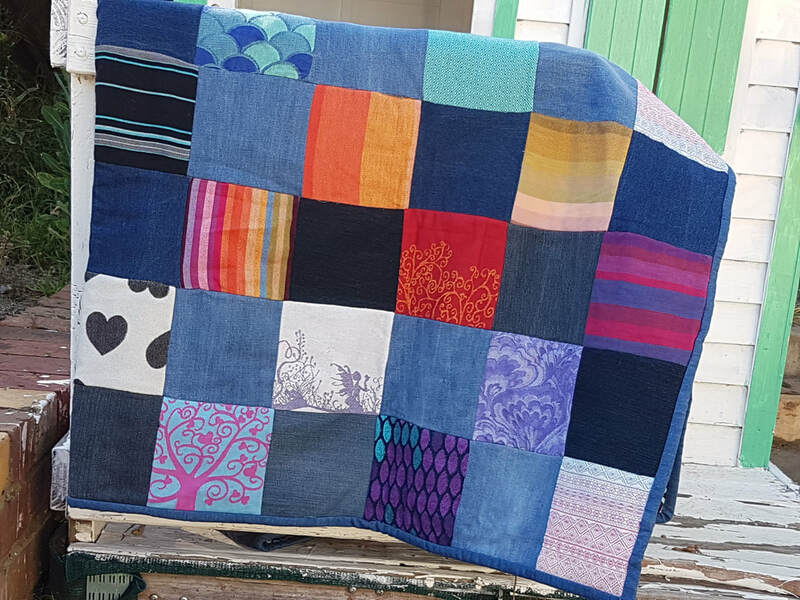 There is no waist strap so the blanket can be made as tall as short as you need depending on how it's tied. 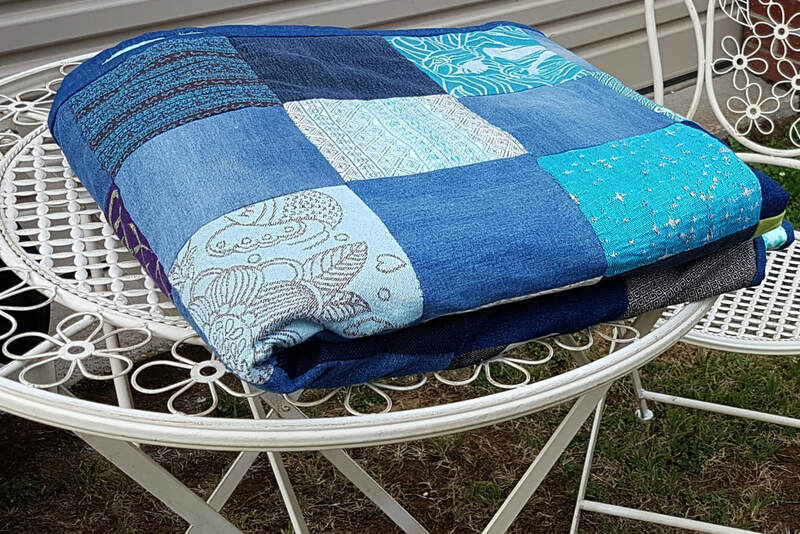 No need to cinch the blanket to get the width right. The structure is provided by the straps so the width is always just right. Excellent for a high back carry. Great for curious children who like to see over your shoulder. Very customizable. Easy to have baby high or low depending on which carry you choose to tie. Can be used for a torso carry - no weight on your shoulders. Narrow blanket podaegis can also be use for a very comfortable front wrap cross carry/back wrap cross carry. As the he first pass goes around your torso pressure on your shoulders is minimized so it's great for those with shoulder problems. Fast to put on! 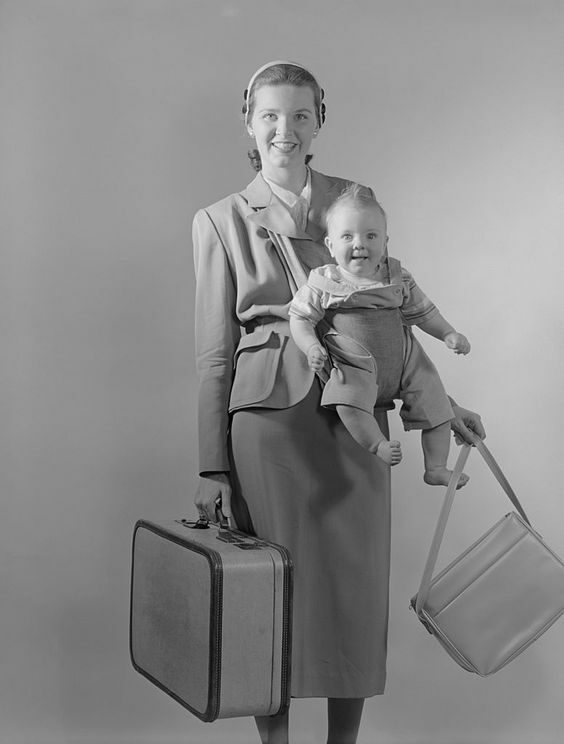 In a back carry you can just wrap the top straps under baby's arms and toss them over your shoulder, then tie over/under baby legs and tie around your waist. This neat and tidy santa toss doesn't leave people and running to help in public and grabbing your straps because the tying process is over so quickly. 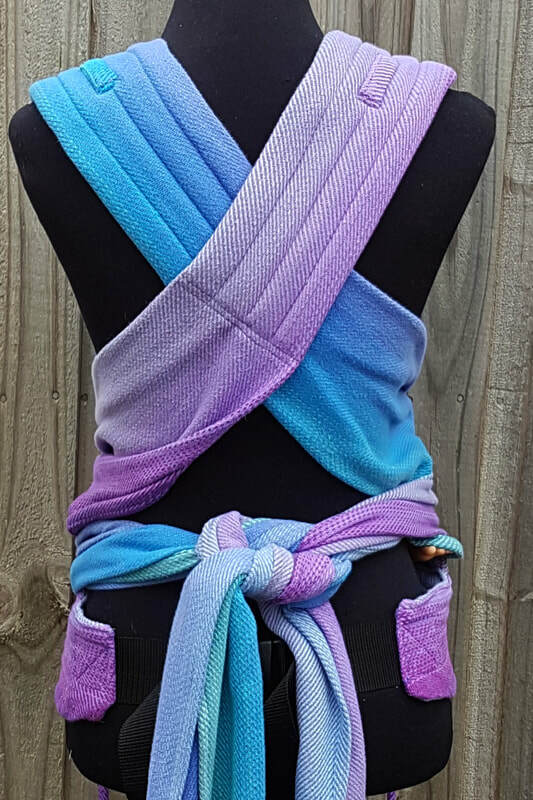 Great for an up and down toddler because narrow blanket podaegis are so quick to put on your back, with the comfort and convenience of having only one knot to tie, and easy to carry around when your toddler doesn't want to be worn. You can also tuck the blanket up in a front carry to keep it out of the way. Here's how https://www.youtube.com/watch?v=vFEHdwJmQ6o. Very easy to share between different sized wearers. Wrap like tying and versatility. Narrow blanket podaegi's are not quite as quick to learn to tie as a meh dai/ mei tai but not as difficult to learn as a wrap as there is no need to learn to make a seat - that is done by tying the straps. Podaegis are like a woven wrap with training wheels in a way, as you can do many of the same carries. 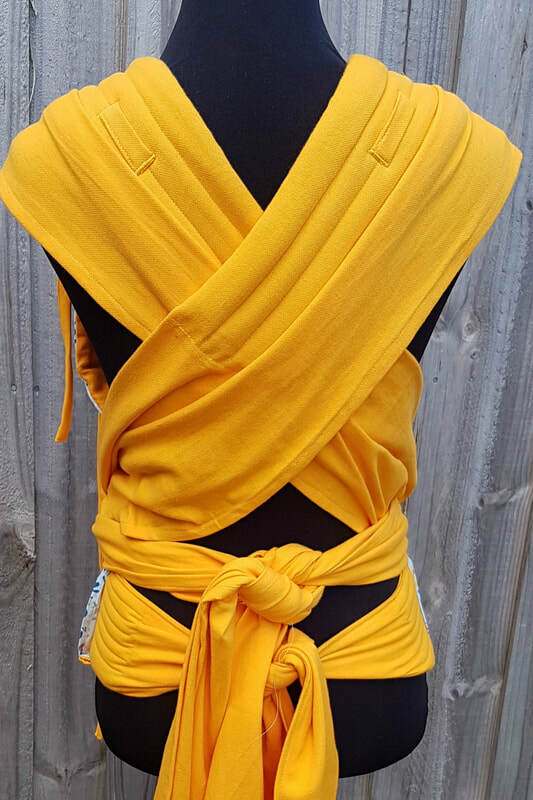 Can be made reversible so you can have two looks in one. Want to know more? See this page.